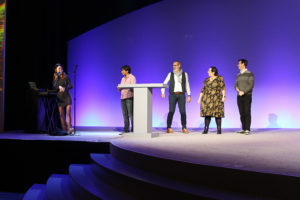 First of all: A huge apology for my mistake in my third blog posting from Connect 2017. 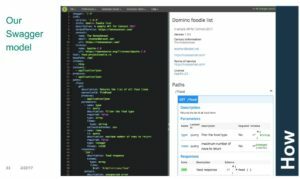 In this I wrote that Domino for iSeries would not be supported in the future. This is not true! I had misunderstood and the blog posting is now corrected. Sorry to IBM and all IBM partners and customers who have contacted me in the past few days (some in panic). 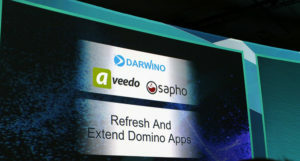 So to sum up: You will still be able to use Domino, as well as get all new feature packs, on iSeries. Ok? With that cleared up I would like to talk a bit about the part of the conference that we who go there sometimes talk and blog too little about. Maybe that’s because employers and organisations pay us good money to go there, and we don’t want it to appear as if we are just partying for four days. By all means, we are partying, but that’s only part of it. Mingling is one of the big reasons to go to Connect. Going into the sponsor area to talk to IBM partners is a wonderful opportunity to both get and give help and tips. The same goes for the opportunity that you have to talk to IBM’s product managers as well. Two years in a row now I’ve managed to solve big problems that my employer, customer or myself have had. And that’s just by a five minute conversation. This is at times invaluable. For me personally, this year was also a wonderful opportunity to meet potentially new customers or employers. I’m currently freelancing, since I’m temporarily laid off from my day job because of the company’s financial situation. But I’m also looking for a new day job, if I find it to be a good opportunity. So I did three job interviews while over in San Francisco. 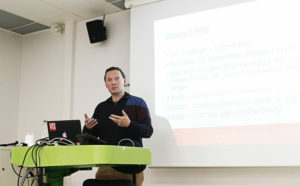 I’m also the second in command for the Norwegian IBM Collaboration User Group, and I recruited several potential speakers for the spring meeting that will take place on June 7th and 8th (You are more than welcome to come, and if you want to do a presentation, get in touch with me). 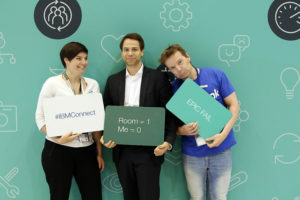 Another good thing about the social bit is that you get to meet people you normally only communicate with via blogs, twitter, Facebook, IBM Connections, chat, email or phone calls. The ICS (IBM Collaboration Solutions, formerly the Lotus crowd) club is a very welcoming and including one. Meeting face to face over a beer (or five) and discuss frustrations, ideas, positive experiences, new solutions and stories is very educational. I’ve lost count of how many times someone has given me assistance or help with something I’ve been struggling with, or simply given me great ideas on how to proceed on a big project. Hopefully I’ve done the same with others. Which brings me to the IBM Champions program. I became IBM Champion for 2017. During the conference the champions got some special perks, like a lunch, a carousel ride, t-shirts, badges, a discount on the conference fee and most important of all: We hung out together, furthering our bonds and friendships. They are a great bunch of people, and we were duly taken brilliantly care of by Amanda Bauman and Libby Ingrassia. This is the first time the conference wasn’t in Orlando. This means that IBM couldn’t take us to an amusement park, as they always used to do in the past. 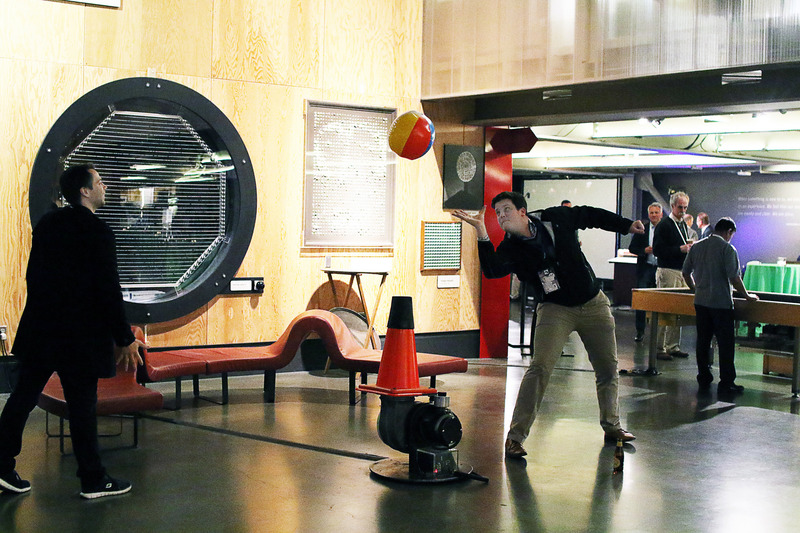 Instead they took us the the brilliant Exploratorium at the piers in San Francisco. It’s a museum that teaches you about technology and nature, and you can try experiments yourself, hands on. Perfect for a family outing, as well as for nerds. There was also loads of good food, drinks and music. And it was yet another chance to mingle, get to know people, bond and try out fun stuff. I’m not sure where my future lies these days. It can go anywhere. But I know I’m very happy that I got to go to the conference this year. Because I learned, nurtured, grew and shared. Both personally and creatively. And that is why an employer should let their employees go to these things. IBM Connect 2017 #4: Start Thinking and Get Pinking! 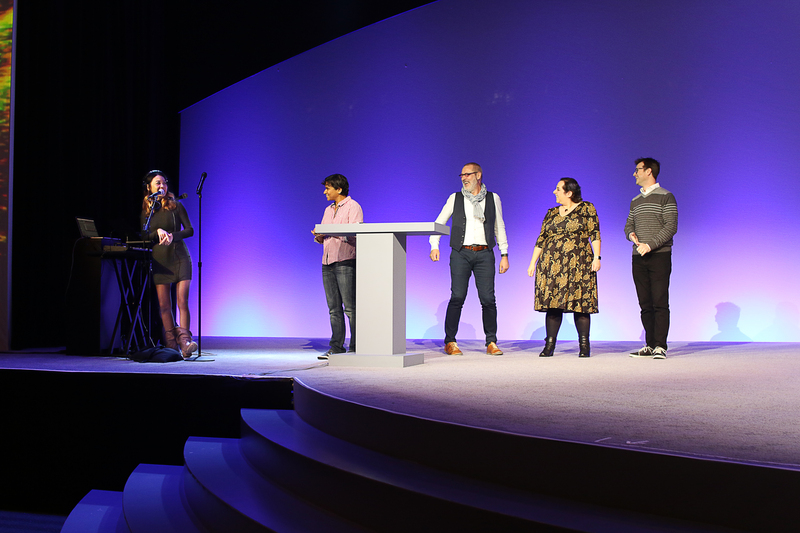 Sorry for being late with following up on the Connect 2017 conference, but the last days in San Francisco just flew by like a whirlwind. And after I got home I was stuck on the couch with flu like symptoms. But now I’m ready to talk to you about the future of IBM Connections, which is pink! The point I really, really liked was the fact that you now can make the area that describes what the community is about as large as you like. AND: You can now just paste whatever HTML code you like into that area! 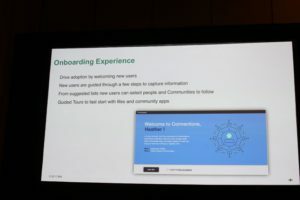 This means that you very easily can create your own social intranet without having to skin Connections to fit your internal design guidelines. This is a very smart move by IBM, and I like it! It’s something my previous employer was desperately hoping for, and was promised was possible, only to find out it wasn’t. The future for Connections beyond 6.0 is Pink! Now, what does Connections Pink mean? It’s not the next version of Connections, per se. 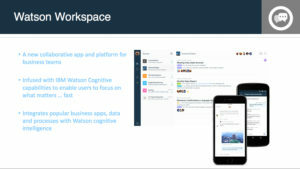 It’s more a new way of developing the platform, developing towards and with the platform, the way it will be updated and a new way to work, not only with Connections but with Watson and the ICS portfolio. Connections Pink is also a new development platform which makes it easier for people to contribute by creating your own extensions for Connections. It’s a completely open ecosystem which is made for developers, with a new technology stack. This is probably the most exciting new thing coming out of Connect 2017. The plan is to make this available from September 2017. Personally I can’t wait to play around with it. It will also be amazing to combine this with the development platform for Watson Workspace. Just think of the possibilities you will have to analyse usage, data and a whole lot of other parameters. 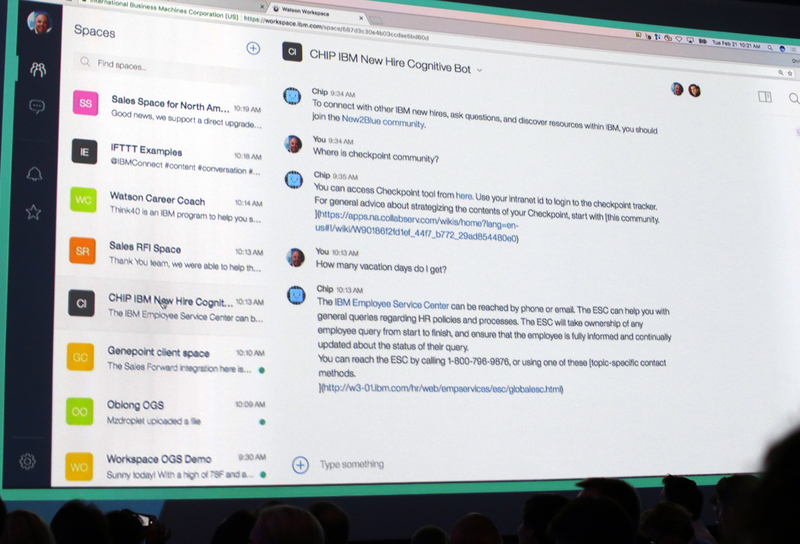 This is exciting, and I truly hope IBM will communicate this out to its customers. And most important: Use their IBM partners to help people understand what it is and all the possibilities it gives you! 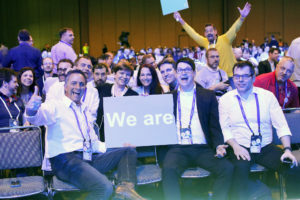 Still in the US, but in a new city, on a new date and with a lot of new things you normally don’t associate with Lotusphere, now known as IBM Connect. The city is San Francisco and the location is Moscone West, a gigantic conference center in downtown San Francisco. This is a question that a lot of people are concerned with, because IBM has been heavily promoting companies to move their email to the cloud, and then start using IBM Verse. 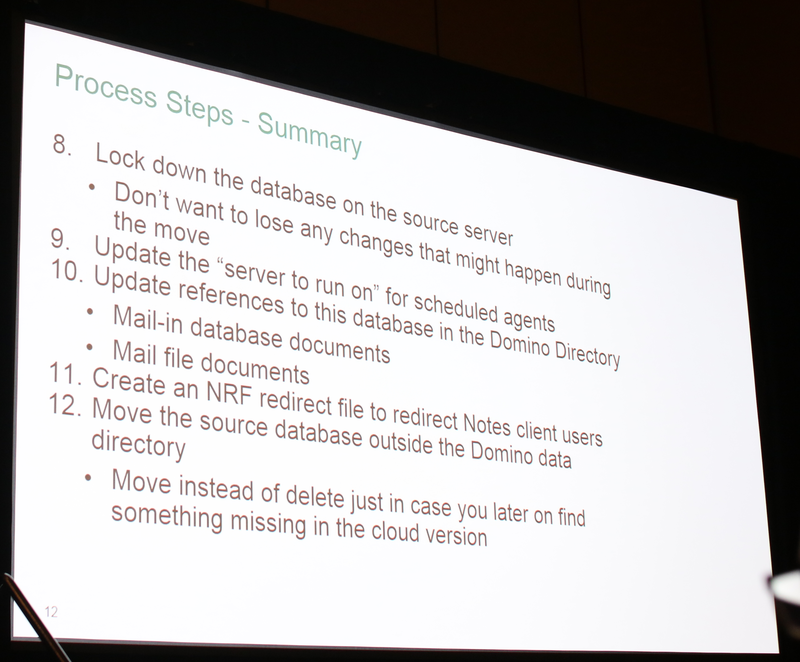 But most of us have a lot of applications running in Notes, which means we still got to run and administrate local Domino servers. Can these be moved to the cloud? Yes, turns out that they can. And IBM showed us how. Most of us are responsible for gigantic .nsf-files with huge amounts of data. Personally I’ve been responsible for databases with a logical size of 100 GB. This is of course only possible through the use of DAOS, which stores the attachments, since an .nsf-file only can be as big as 64 GB. How do you move all this data to the cloud? You could use good old fashioned Domino replication. This is going to take time, but it’s stable and very reliable. If you lose your internet connection, it will just continue when you get your connection back. FTP: Quicker than replication, but it has to be monitored. And if you lose your connection, you need to start all over again. Physical storage: Moving data via a hard drive, which you then ship off to the data center where they will copy it for you. This will take quite a bit of time, but you won’t have any problems with network connectivity. Moving data online can take quite a bit of time, days even, so this must be planned in detail. Users will experience quite a bit of downtime if you don’t take advantage of weekends or holidays. IBM calculates that this will take a couple of days. Before you start moving you must analyse and plan what applications you need to move. Some applications might not be needed anymore, or they could be replaced with other solutions. 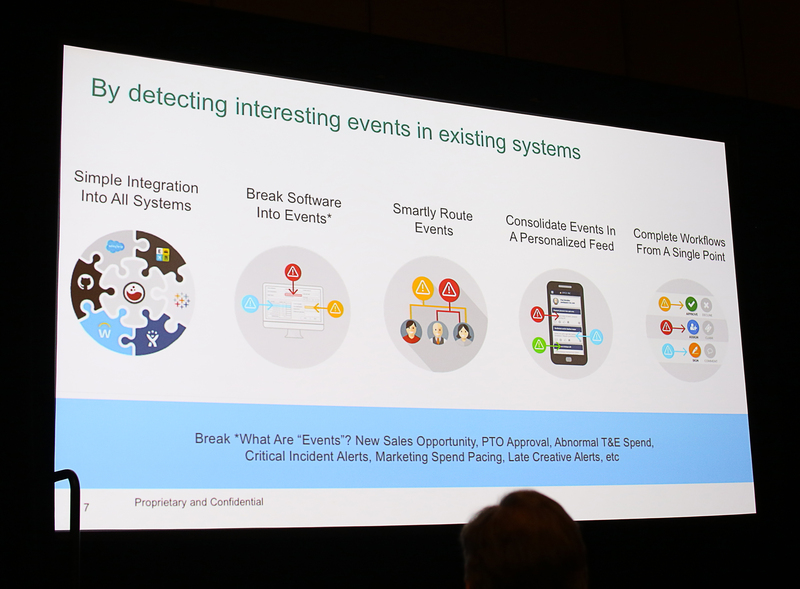 IBM can assist with all of these things via specialized tools. And yes: You will be able to do this, even if you are running DAOS. First one out was René Winkelmeyer from Salesforce.com. He’s a former star in the Domino environment, but left for Salesforce last spring. He works there as a Senior Development Evangelist. There were those who questioned why ISBG would invite Winkelmeyer to give this lecture. The reasons are that IBM has bought one of the largest Salesforce consultant companies in the world. 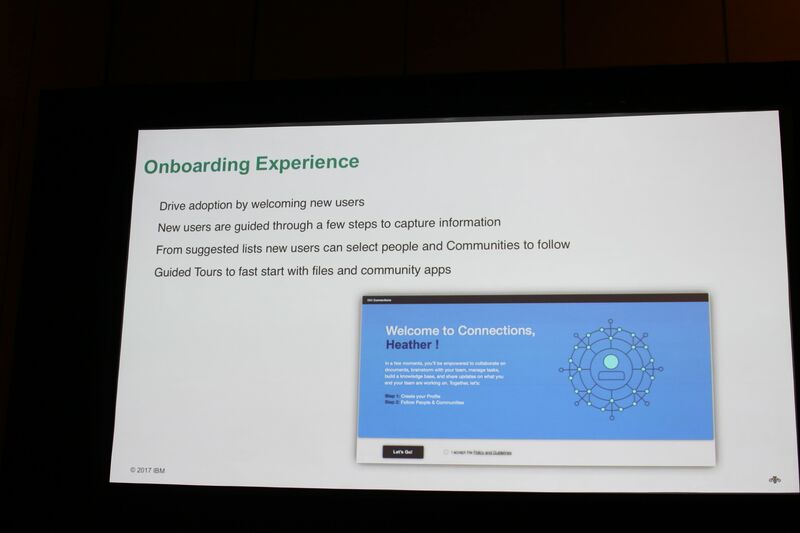 In addition, Salesforce is very compatible with the IBM Collaboration Solutions. 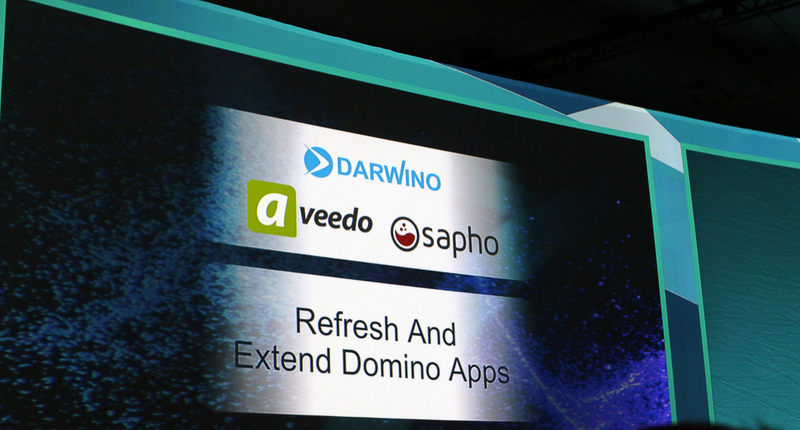 Several people who used to work with Notes/Domino are today working with Salesforce, and there are also those who work with both platforms. Winkelmeyer explained the differences and similarities between the platforms. 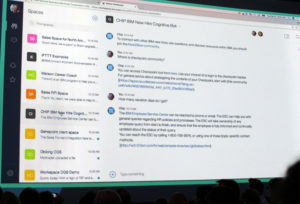 Winkelmeyer then did a demo where he showed how a Salesforce applications worked seamlessly inside a community in IBM Connections, including sharing of files. 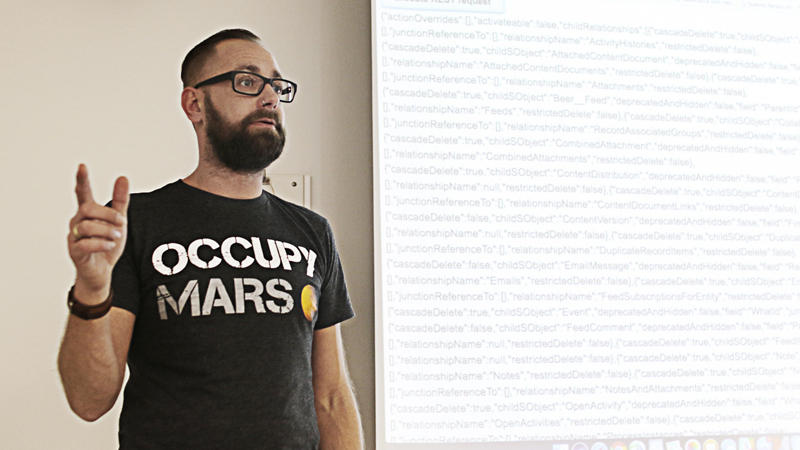 He then showed how he could copy an email from IBM Verse and into an application in Salesforce. 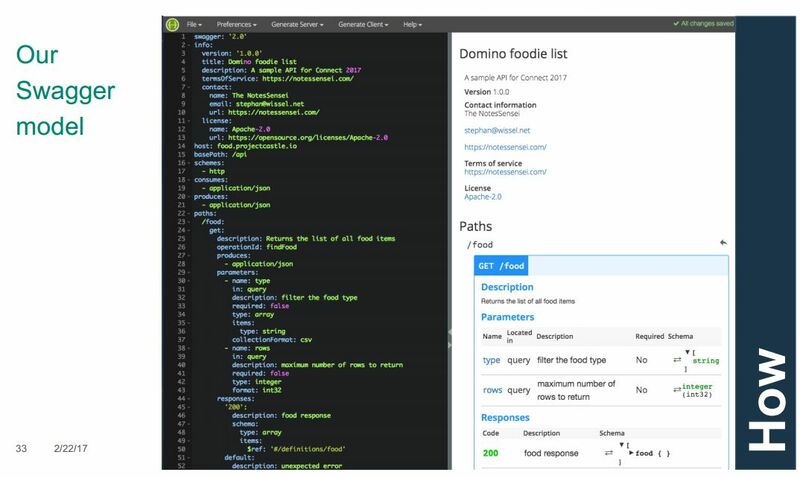 This is made possible via the APIs in Connections and Verse. Winkelmeyer’s main point was that the philosophy where you bind yourself to one system or platform doesn’t cut the mustard anymore. Today everything is about integration, not to mention web and mobile based solutions. Julian Woodward is a legend in the Notes/Domino community. In the past few years he has worked for LDC Via, a London based company specialising in helping companies lift their data out of Domino. 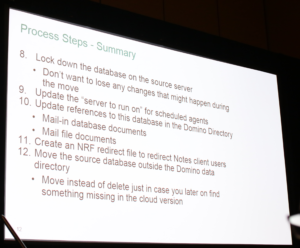 In his presentation, he walked through the challenges that comes with such a migration, whether you want to leave Domino completely or stay on Domino and only move out of the Notes client. The challenges are both technically and for the business. For the latter you have to consider budgets, strategies, politics and infrastructure. Very often the organisations are very surprised about how tightly integrated the Notes applications are in the daily business, and how vast they really are. On the technical side the challenge is that IT wants more standardised applications and systems and less specialised systems that are developed in house. This demands a lot of restructuring and in a Domino environment this can be especially challenging. You have Notes agents, server integrations (both between Notes applications but also with other systems and platforms), APIs and server add-ons. Scheduled agents are especially tricky as no other systems have that. How long will a new application last? Is it really worth it? Grete Funderum Stillum is a lawyer and partner with Brækhus Drege Lawyers DA. She gave a session that many were surprised was on the agenda. This was a about corporate law and not technology. The feedback afterwards, however, was great. People found it very interesting and felt that we should repeat it during the spring meeting. She received a lot of questions during the presentation, so it was clear that she struck a nerve with people looking to move into the cloud. 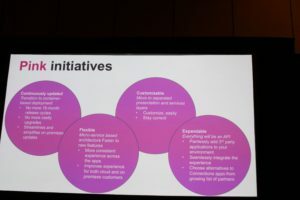 Funderum’s point was that organisations often forget the judicial demands coming into play when moving into the cloud. Her message was that this should be one of the main concerns already from the start of such a migration project. One of her examples was that standard agreements with cloud providers very often were non negotiable. She also pointed out that you are responsible, and not the cloud provider. However, it was very beneficial for a cloud provider if they had expertise about this so that they could guide the customer. Personal data is something that the law is very strict about (but strangely not when it comes to cookies!) and it’s also a difference between sensitive personal data and regular personal data. The Norwegian watch dog Datatilsynet has specialized forms and guides on how to take care of this. In May 2018 a new EU regulative will come into play. This will make it necessary to document your internal control on data security in your organization. 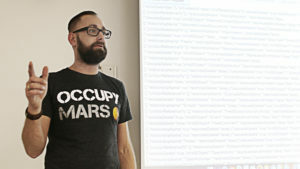 The presentation can be seen here, but in Norwegian only. After a lovely tapas lunch it was time for a presentation from Swede Erik Näslund. He works in EGBS which specialises in transforming IBM Connections into a social intranet with focus on user needs. Their philosophy is that if you need to train your users to use a system, you’ve failed. As an example, he used his cell phone and Ipad. Most people are able to start using them without any form of training. Why aren’t your tools at your workplace like this? In the future robots and automated processes will perform more and more of the routine labour we perform today. We should therefore concentrate more and working with knowledge and creative jobs. Instead we are using a lot of time on chores like registering hours. Näslund says this is completely unnecessary. – My cell phone already know I’m in Oslo, when my plane took off and when I’m back at the office. I still have to register this manually in our internal systems at work. This should happen automatically. He pointed out that even if the death of email was greatly exaggerated, people still don’t read their emails. They only read the first four lines. The solution is very often to install IBM Connections and share information there. The result is that 10-20% of the employees adopts to using Connections. This is not productive. So then you start training your users and start choosing super users and so on. You then end up with a 40% adoption rate. The reason is that people are not interested in learning about files, communities, profiles etc. The way we think when we want to introduce a collaboration tool is completely wrong. The processes and people should not have to adapt, it’s the product that should adapt to the users way of doing things. Digitalisation of the workplace is not an IT investment, it’s a continuous project. Adapt the technology, not the users! You can download Näslund’s presentation here! 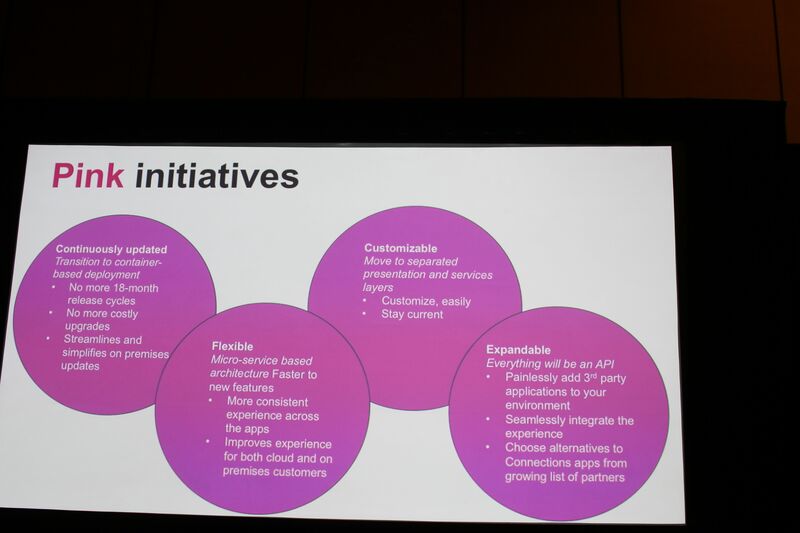 The first thing Kjell Langeland from IBM Norway pointed out when he started his session was that even if Softlayer was the foundation of IBM’s new data centres, the service is now called IBM Bluemix. This autumn they opened a new data centre at Fet in Norway. Such data centres are called Bluemix Data Centre and what used to be called Softlayer is now known as Bluemix Platform. The customer can rent a physical server. With the help of wizards she can set up and configure the server (operating system, surveillance software and so on). You can also rent on an hourly basis pr month. IBM and VMWare is now conduction a strategic cooperation where IBM can rent out VMWare licenses in Bluemix. So far the Norwegina data center has gained 100 customers, and a lot of well known platforms and companies are using the service. There was a big interest in this session, and Langeland received a lot of questions. You can see the entire presentation here! You can get all the details in their presentation here! We finished up with a Kahoot quiz which this time was a pop quiz. I won but as second in command at the ISBG board I only won fame and glory. Julian Woodward got away with the prize. After a raffle and some more prizes Hogne thanked everybody for coming. He then asked for help in promoting ISBGs activities and said that the board of ISBG appreciates any feedback from their members about the future of ISBG. It’s obvious that the bar is set higher these days for traveling to conferences. All ideas are welcome. The day was rouned up with IBM Norway treating us to pizza and drinks, so we all went full home. Full of both knowledge and food. The next ISBG meeting is the spring seminar in June of 2017, but you shouldn’t be too surprised if there are other activites before that. Stay tuned! A huge thanks to BI for lending us a conference room and for a splendid lunch, and heart filled thanks to IBM Norway who always are supportive of our conferences.